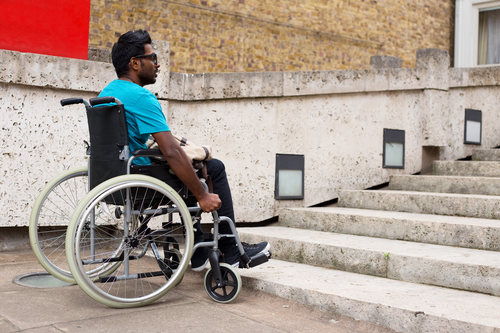 The idea of universal accessibility in public spaces is often thought of with wheelchairs and stairs. However, there are many different abilities that are often not visible and could create hardship for those who do not necessarily “fit the mold” of the environment they are in. Universal accessibility should be broadened to consider those with different abilities that are often not visible, especially in public service environments such as hospitals or schools. It is not enough to tolerate difference – this is to merely allow it to exist. We must also welcome difference. I remember the day someone first said to us that our son might be Autistic – have Asperger’s Syndrome. Daniel was in the 5th grade and my husband, Mike, was attending his annual Special Education ARD (Annual Review and Dismissal) meeting. I was in the car driving to my graduate school class when my husband called – confused and unsure of what the SPED staff was talking about. Daniel received private speech therapy. Then, when he entered school he received speech therapy and for a time occupational therapy. We knew that he had social and communication challenges but up to that point we just thought of it as Daniel’s quirky personality. On some levels it was a relief to give it a name but it also brought so much fear and uncertainty. Looking back, I think it was in some ways a blessing to give a name to his unique qualities relatively late in his development. We were able to treat the challenges that came up as specific issues that needed to be addressed. When he had trouble relating to or communicating with children or teachers I would problem solve each incident with no expectation that he could not respond in a more “neurotypical” way. The diagnosis did provide us some benefits. It allowed us some extra protections and accommodations that allowed Daniel to grow, explore, and participate in school in ways that would have been difficult otherwise. The diagnosis served as a protective shield when teachers and the school culture were not accommodating. Daniel desperately wanted to participate in the Audio-Visual program at his high school. He heard about it in middle school and was so excited to sign up for the elective his freshman year. Throughout his freshman year I never once heard from his teacher. His academic and conduct grades were good and I had no reason to think there were any issues. Daniel tried to sign up for the 2nd year of the course and needed the teacher’s approval, which she denied. I requested a meeting and was shocked when she produced two typed pages of what she stated were the behaviors Daniel exhibited in class and indicated that he would not be successful in the course. I was stunned and speechless and I asked her why she never once called, emailed or reached out in any way. Her reply was – “I thought you knew how he was.” I still can’t understand how a teacher let a student struggle for a year and did nothing. We had Daniel sit out of the class for his Sophomore year. We took the list from the teacher and talked about the skills he needed to demonstrate and worked with him on those. Meanwhile, he had a Chemistry teacher who refused to tutor Daniel. She said to me and a member of the school administration that she did not know anything about “children like Daniel” and would not be able to help him. Their solution was to offer tutoring with another teacher and then move Daniel out of her class at the semester break. As the time rolled around for Daniel to select classes for his Junior year he once again tried to sign up for Audio-Visual 2 and was denied. I meet with school staff and was told that it was at the teacher discretion and that she did not need to provide reasons for her decision. The main objection seemed to be that they were not sure if Daniel could work independently or communicate professionally (like a reporter). A school administrator said he would meet with Daniel and assess these skills. The administrator called us back that evening and said that Daniel did great but that the teacher did not want to work with him so the denial would stand. At this point Mike and I had enough. I researched SPED laws and began to file my formal complaint with the state against the school district. Children under the SPED umbrella in Texas are provided a few protections. The first, is there cannot be any secret assessments that are used to deny or determine services. The teacher could not produce any criteria or system for approval or denial in the course. The second, is the school needs to make accommodations or demonstrate why it is not possible if the reason for the denial is based on the diagnosis. After a couple of angry phone calls the school relented and I was told that the district staff would have to meet over the summer and rewrite the course to accommodate him. I was told to expect to attend meetings at the beginning of the year to discuss the needed changes. They made it clear that I was unreasonable and creating a burden for the school. They never met and no additional accommodations were made. Daniel took Audio-Visual 2 and later 3. He won a national award for one of his reports and anchored the school newscast his Senior year. He later worked on the Trinity University – Tiger TV newscasts all 4 years he attended college. In 2015, he was an extra in the movie My All American. In architecture there is a principal called Universal Design. Public spaces like buildings and I would argue public services, like schools, medical facilities, government office and business, should serve the public – all of it.It is not enough to tolerate difference – this is to merely allow it to exist. We must also welcome difference. Growing and learning is ultimately a social experience. It occurs in environments with contexts and relationships. If we are to recognize the value and potential of all human life then individuals regardless of “age, size, ability or disability” must be welcomed in public spaces. Welcoming differences is not burdensome or difficult. It is frustrating to me that we needed the Autism diagnosis to ensure that Daniel received fair treatment. But those struggles were worth it. His life today is a testament to his perseverance and ability to forgive and forget. In addition to being a wife and the mother of three sons (and 2 dogs), Dr. Amy Mulholland has 20 years experience as an educator. Her middle son is on the spectrum and in an effort to figure out his life and learning experiences she sought to understand the emotional, social, and educational needs of children that learn differently. Amy has taught preschoolers, middle schoolers, and college students. Additionally, she worked as a parent educator, helping parents understand the unique needs of their children. Amy received her Doctorate of Education in Curriculum and Instruction (Social Education) from the University of Houston in 2009. Most recently, Amy works and volunteers for several local nonprofits that advocate for vulnerable children.